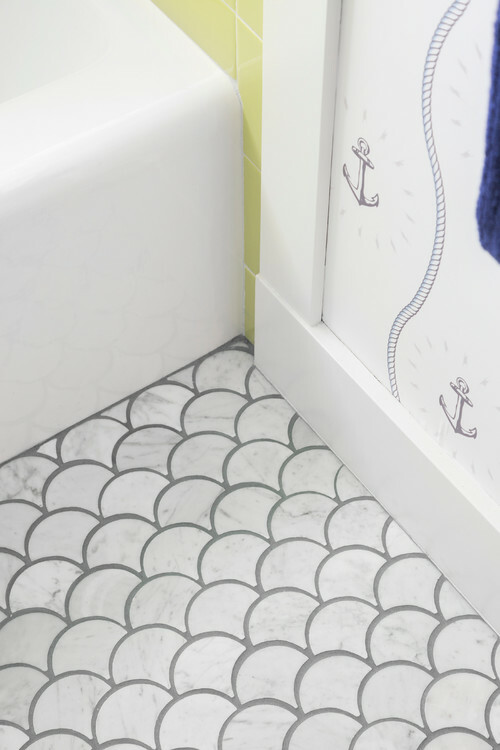 Without changing the footprint of this children’s bathroom, designer Catherine Schmidt aimed to lighten and visually expand the previously dark, long and narrow layout. 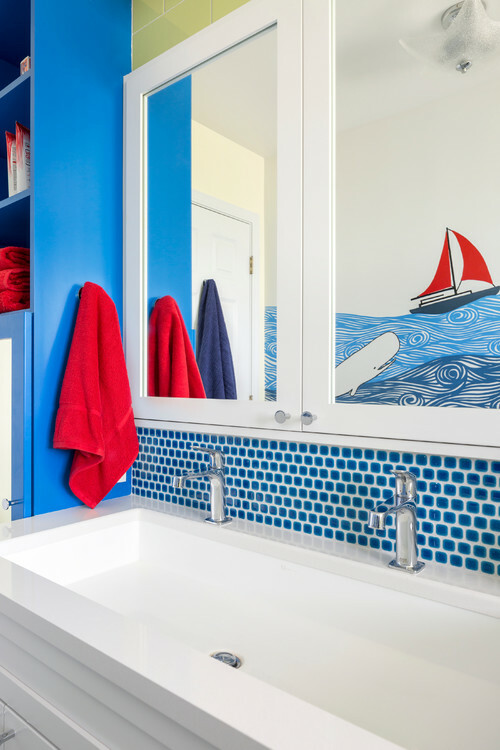 Vibrant colors and a nautical theme did the trick, while a clever pullout step stool gave her clients’ kids a better way to reach the sink without cluttering up the space with furniture. 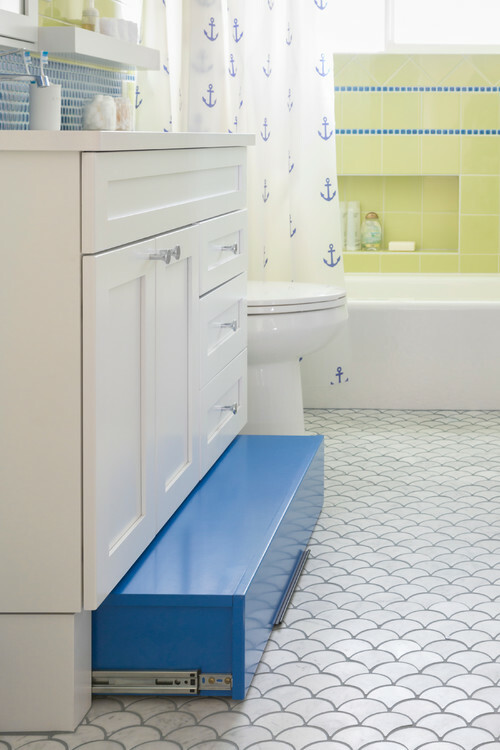 A happy yellow-and-blue color palette energizes the once-dark bathroom. The homeowners cut out nautical images from posters, wallpaper and online art, then pasted them together for a mood board. Artist David Heck used this for a springboard to paint the nautical mural on the right. Schmidt played with changing the directions of the yellow tiles to add dimension and an almost wavelike feel. In lieu of a common step stool, Schmidt designed this custom pullout to give the kids an extra boost up to the sink. Builders from Canyon Creek Cabinet Co. built it to slide in and out like a drawer; rubberized feet keep it stable while in use. Schmidt incorporated tiles resembling fish scales on the floor. Anchor-printed wallpaper on the lower part of the wall further pushes the nautical theme. Blue and yellow work their way around the tub-shower. 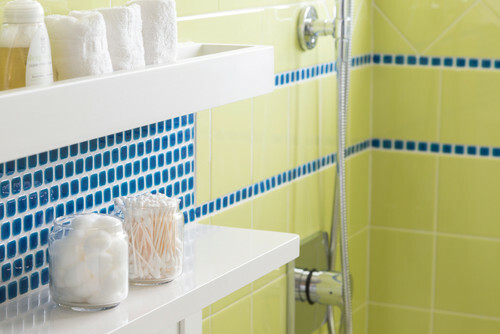 Simple porcelain in indigo blue hits the backsplash, while tiles in a Key lime yellow work their way around the walls. A mirrored medicine cabinet reflects the nautical mural and the glass starfish light overhead.